The Mazda Radar Cruise Control (MRCC) system is designed to maintain headway control *1 according to the vehicle speed using a radar sensor (front) to detect the distance to a vehicle ahead, and by presetting the vehicle speed between 30 km/h (19 mph) and 145 km/h (90 mph), the driver is freed from having to constantly use the accelerator or brake pedals. *1 Headway Control: Control of the distance between your vehicle and the vehicle ahead detected by the Mazda Radar Cruise Control (MRCC) system. Additionally, if your vehicle starts closing in on the vehicle ahead because, for example, the vehicle ahead brakes suddenly, a warning sound and a warning indication in the display are activated simultaneously to alert you to maintain a sufficient distance between the vehicles. WARNING Do not rely completely on the Mazda Radar Cruise Control (MRCC) system and always drive carefully: The Mazda Radar Cruise Control (MRCC) system is designed to reduce load on the driver, and although it maintains a constant vehicle speed, or specifi cally, it maintains a constant distance between your vehicle and the detected vehicle ahead according to the vehicle speed, the system has detection limitations depending on the type of vehicle ahead and its conditions, the weather conditions, and the road conditions. Additionally, the system may be unable to decelerate suffi ciently to avoid hitting the vehicle ahead if the vehicle ahead applies the brakes suddenly or another vehicle cuts into the driving lane, which could result in an accident. Always verify the safety of the surrounding area and depress the brake pedal or accelerator pedal while keeping a safer distance from vehicles ahead or on-coming vehicles. Do not use the Mazda Radar Cruise Control (MRCC) system in the following locations. Roads with sharp curves and where vehicle traffi c is heavy and there is insuffi cient space between vehicles. Roads where frequent and repetitive acceleration and deceleration occur (Driving under these conditions using the Mazda Radar Cruise Control (MRCC) system is not possible). When entering and exiting interchanges, service areas, and parking areas of highways (If you exit a highway while headway control is in use, the vehicle ahead will no longer be tracked and your vehicle may accelerate to the set speed). Slippery roads such as ice or snow-bound roads (The tires could spin causing you to lose vehicle control). Long descending slopes (to maintain distance between vehicles, the system automatically and continuously applies the brakes which could result in the loss of brake power). For the purposes of safety, switch the Mazda Radar Cruise Control (MRCC) system off when it is not being used. CAUTION If the vehicle is towed or you are towing something, switch the Mazda Radar Cruise Control (MRCC) system off to prevent an incorrect operation. The Mazda Radar Cruise Control (MRCC) system operates when all of the following conditions are met. The vehicle speed is about 30 km/h (19 mph) to 145 km/h (90 mph). The Mazda Radar Cruise Control (MRCC) system is turned on. The parking brake is not applied. The Forward Obstruction Warning (FOW) warning light (amber) does not illuminate. The Dynamic Stability Control (DSC) is operating normally. The shift lever is in a position other than reverse (R) or neutral (N). The clutch pedal is not depressed. The selector lever is in the drive (D) position or manual (M) position (manual mode). In the following cases, the warnings may not activate even if your vehicle starts closing in on the vehicle ahead. You are driving at the same speed as the vehicle ahead. Directly after the Mazda Radar Cruise Control (MRCC) system has been set. When the accelerator pedal is depressed or directly after the accelerator pedal is released. Another vehicle cuts into the driving lane. The following are not detected as physical objects. If a vehicle ahead is traveling at an extremely low speed, the system may not detect it correctly. During headway control travel, do not set the system on two-wheeled vehicles such as motorcycles and bicycles. Do not use the Mazda Radar Cruise Control (MRCC) system under conditions in which the close proximity warnings are frequently activated. During headway control travel, the system accelerates and decelerates your vehicle in conjunction with the speed of the vehicle ahead. However, if it is necessary to accelerate for a lane change or if the vehicle ahead brakes suddenly causing you to close in on the vehicle rapidly, accelerate using the accelerator pedal or decelerate using the brake pedal depending on the conditions. While the Mazda Radar Cruise Control (MRCC) system is in use, it does not cancel even if the selector lever (automatic transaxle)/shift lever (manual transaxle) is operated and any intended engine braking will not occur. If deceleration is required, lower the vehicle speed setting or depress the brake pedal. The brake lights are illuminated while the Mazda Radar Cruise Control (MRCC) automatic braking is operating. The Mazda Radar Cruise Control (MRCC) warning light (amber) turns on when the system has a malfunction. The setting status and operation conditions of the Mazda Radar Cruise Control (MRCC) system are indicated in the active driving display. If your vehicle rapidly closes in on the vehicle ahead because the vehicle applies the brakes suddenly while you are traveling in headway control, the warning sound activates and the brake warning is indicated in the display. Always verify the safety of the surrounding area and depress the brake pedal while keeping a safer distance from the vehicle ahead. Additionally, always keep a safer distance from the vehicles behind you. When the ON switch is pressed, the vehicle speed and the distance between vehicles while in headway control can be set. The Mazda Radar Cruise Control (MRCC) indication is shown in the active driving display. NOTE Whben the ignition is switched to ACC or OFF while the Mazda Radar Cruise Control (MRCC) is ON, the Mazda Radar Cruise Control (MRCC) remains ON automatically. Adjust the vehicle speed to the desired setting using the accelerator pedal. Headway control begins when the SET or SET switch is pressed. The set speed and the inter-vehicle distance display filled with white lines are displayed. The Mazda Radar Cruise Control (MRCC) indicator light (green) is indicated simultaneously. If a vehicle ahead is detected while traveling at a constant speed, the vehicle-ahead indication is displayed and headway control is performed. Additionally, when a vehicle ahead is no longer detected, the vehicle-ahead indication turns off and the system switches back to travel at constant speed. If you are driving the vehicle at a speed faster than the set speed, headway control on the vehicle ahead is not possible Adjust the system to the desired vehicle speed using the accelerator pedal. The distance between vehicles is set to a shorter distance each time the switch is pressed. The distance between vehicles is set to a longer distance by pressing the switch. The distance-between-vehicles can be set to 4 levels; Long, medium, short, and extremely short distance. The distance between vehicles differs depending on the vehicle speed, and the slower the vehicle speed, the shorter the distance. When the ignition is switched to ACC or OFF and then the engine is started again, the system automatically sets the distance between vehicles to the previous setting. Press the SET switch to accelerate. Press the SET switch to decelerate. The set vehicle speed changes as follows each time the SET switch is pressed. NOTE For example, the set vehicle speed is changed by pressing the SET switch four times as follows: The vehicle speed accelerates or decelerates by 4 km/h (4 mph). Depress the accelerator pedal and press and release the SET or SET switch at the desired speed. If a switch cannot be operated, the system returns to the set speed when you release your foot from the accelerator pedal. CAUTION The warnings and brake control do not operate while the accelerator pedal is depressed. When accelerating using the SET switch while in headway control, the set vehicle speed can be adjusted but acceleration is not possible. If there is no longer a vehicle ahead, acceleration continues until reaching the set vehicle speed. Check the set vehicle speed by viewing the set vehicle speed display in the active driving display. When depressing the accelerator pedal, the inter-vehicle distance display in the active driving display changes to the white-line display. The minimum settable speed is 30 km/h (19 mph). If the set vehicle speed reaches 30 km/h (19 mph) using the switch operation, constant speed travel is maintained at about 30 km/h (19 mph) even if the SET switch is pressed. The Mazda Radar Cruise Control (MRCC) system is not canceled. The Mazda Radar Cruise Control (MRCC) is canceled when the OFF switch is pressed. In the following cases, the Mazda Radar Cruise Control (MRCC) system is temporarily canceled and the “MRCC Cancelled” indication is displayed in the display in the instrument cluster. The Mazda Radar Cruise Control (MRCC) indicator light (green) turns off simultaneously. The CANCEL switch is pressed. (Automatic transaxle) The selector lever is shifted to park (P), neutral (N) or reverse (R). (Manual transaxle) The shift lever is in the reverse (R) position . In the following cases, the ”MRCC Cancelled” indication is displayed and the beep sounds one time. The vehicle speed decreases to less than 25 km (16 mph). The TCS has operated for a certain period of time. The Smart City Brake Support (SCBS) has operated. When traveling on a down slope for a long period of time. There is a problem with the system. The shift lever is shifted to neutral (N) for a certain period of time. The clutch is depressed for a certain period of time. The Mazda Radar Cruise Control (MRCC) system may be canceled during rain, fog, snow or other inclement weather conditions, or the front surface of the radiator grille is dirty. 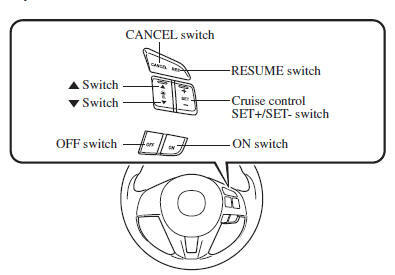 If the Mazda Radar Cruise Control (MRCC) system has been temporarily canceled, you can return to the previously set vehicle speed by pressing the RESUME switch after the following conditions have been met. All of the Mazda Radar Cruise Control (MRCC) operation conditions have been met. A certain period of time has elapsed since the system was automatically canceled while driving for a long time on a down slope. If the SET /SET or RESUME switch is pressed before a certain period of time has elapsed since the system was automatically canceled while driving for a long time on a down slope, “MRCC Not available” is displayed in the display. If the OFF switch is pressed to cancel the Mazda Radar Cruise Control (MRCC), the system does not return to the previously set speed even if the RES switch is pressed. The shift-up or shift-down request display in the active driving display may be displayed while the Mazda Radar Cruise Control (MRCC) system is operating. When this occurs, shift gears because the gear position is not appropriate. If the gears are not shifted up even though the shift-up request indication is displayed, load will be applied to the engine and the Mazda Radar Cruise Control (MRCC) system may be automatically canceled or engine damage could occur. If the gears are not shifted down even though the shift-down request indication is displayed, the Mazda Radar Cruise Control (MRCC) system may be automatically canceled or engine stalling could occur.